Elegant rods and exquisite tassles to showcase tapestries, curtains or drapes and create an atmosphere of old-world elegance in your home. Designed to complement your tapestries such that your tapestries can display beautifully and elegantly. Length of Hanging Rods can be adjusted accordingly to suit your needs. Adjustable cast iron metal rod with Fancy Feather finials. Finished in antique bronze. Includes mounting hardware. Finial extends approximately 4 inches on each side of tapestry. Extends 15-28". Adjustable cast iron metal rod with Fancy Feather finials. Finished in antique black. Finial extends approximately 4 inches on each side of tapestry. Mounting brackets included. Adjustable cast iron metal rod with Fancy Feather finials. Adjustable Length: 48-108 inches. 2 Brackets Included. Finished in antique bronze. Finial extends approximately 4 inches on each side of tapestry. Designer rod set adjustable cast iron metal rod with Fleur de Lis finials. Finished in antique bronze, with mounting hardware. US$42.00 Fleur de Lis Black Rod 48-84"
Adjustable cast iron black metal rod with black fleur finials. Finials extend approximately 2 inches on each side of tapestry. Extends to a maximum of 48-84". Designer rod set adjustable cast iron metal rod with Fleur de Lis finials. These beautiful rods feature an antique black finish. Adjustable: Extends 48-108". Tapestry rod comes with mounting brackets and finials/ends. Extends 15-28". This rod is flat and hangs very close to the wall creating a high end statement. This rod is flat and hangs very close to the wall creating a high end statement. Rod comes with all mounting hardware. Extends 38-50". 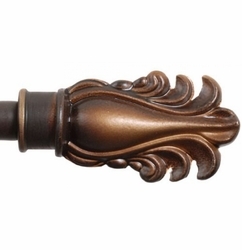 Adjustable cast iron metal rod finished in antique bronze. Includes mounting hardware. This tapestry compliments any of our fine wall tapestries. Extends 48-108"
Finished in antique black. Includes mounting hardware. Extends minimum 22 inches and maximum is 56 inches. The Flat to the wall tapestry rods are approximately 1 inch wide, so the tapestry will hang close to the wall, but with enough "breathing space". Adjustable cast iron metal rod with Fluer de Lis finials. Finished in bronze. Finial extends approximately 4 inches on each side of tapestry. NO LONGER AVAILABLE US$0.00 Fleur Finial Pewter Tapestry Rod 26-50"
Adjustable pewter metal rod with black fleur finials. Includes mounting hardware. Finials extend approximately 2 inches on each side of tapestry. This collection is a pre-qualified and selected for not only their beauty and elegance but also for their functionality, durability and affordability. Inspired by old world elegance that will compliment your draperies and curtains as well as your exquisite tapestries and wll hangings. Adjustable cast iron black metal rod with black fleur finials. Finials extend approximately 2 inches on each side of tapestry. Thickness of rod: half inch. Sold in a set of two, to hang one on each side of your tapestry. An elegant way to showcase your tapestry. Choice of burgundy or sage. The overall length of the tassel from end of cord to bottom of fringe is approximately 30 inches. The tassel itself is approximately 11 inches long. The overall length of the tassel from end of cord to bottom of fringe is approximately 27 inches. The tassel itself is approximately 9 inches long. The overall length of the tassel from end of cord to bottom of fringe is approximately 24 inches. The tassel itself is approximately 7 inches long. Woven in North America. 5" double tassel that can be used as tassels for tapestries up to 40" in height. Viscose & polyester blend. Sold in pairs. The Ellora Tassel is a 9" single tassel that is good for tapestries 40" or more in height. Available in Gold, Earth, Black & Wine.